Captain Benny Griessel of the South African police services wants out - out of his job, his home and his relationship with his singer girlfriend, Alexa. After 602 days dry, Benny can't take any more tragedy. He moves into a hotel and starts drinking. Again. 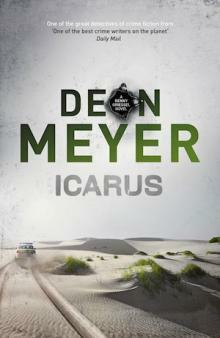 But Benny's unique talent is urgently required to help investigate another crime - the high profile murder of Ernst Richter, MD of a new tech startup, Alibi, whose body is discovered buried in the sand dunes north of Cape Town. Alibi is a service that creates false appointments, documents and phone calls to enable people to cheat on their partners. It has made Richter one of the most notorious people in South Africa. Can Benny pull together the strands of his life in time to catch the killer?